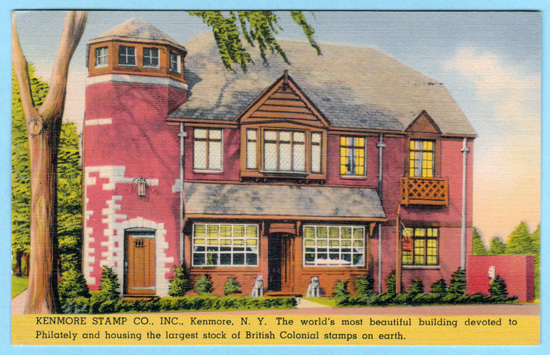 Kenmore Stamp Company started in 1932 in a spare office at the Niagara Falls Smelting and Refinery Corporation in upstate New York. Ernest Greenway Jarvis, president and sole owner of the refinery had been advised by his doctor to take up a hobby. He was badly in need of rest and relaxation. Overwork and fatigue were threatening his health. Returning to his boyhood stamp collection, he quickly became absorbed in this fascinating activity and greatly expanded his albums. On a whim he placed an advertisement offering his duplicate stamps for sale to interested collectors. An avalanche of requests poured in. Working late into the night filling orders and answering correspondence wasn't exactly the therapy the doctor had in mind. Nevertheless, Jarvis was overjoyed to be working with stamps again and thrilled to be of service to fellow collectors. He moved his collection and duplicate stamps to an empty office in his plant. Now he could run his main business and take frequent "time outs" to relax and enjoy his stamp activity. He had the best of both worlds and his health and spirit returned on high. New ads soon appeared under the name of Kenmore Stamp Company and this little business came to life. Two employees were hired when stamps were imported from around the world. As business grew, additional space was needed but none was available at the smelting and refinery operation. It, too, was expanding as the threat of war in Europe loomed. In 1937, a new home was built for Kenmore in the Buffalo suburb of Kenmore, New York and the business continued to prosper. But Ernest had been leading an ever more hectic life in the smelting industry and six years later made plans to retire in Florida. He sold his entire stamp business in 1943 to Boston's famous international stamp dealer, Henry Ellis Harris, founder and president of H.E. Harris & Co., who was delighted to have the huge Kenmore stock. During the war years postage stamps could not be imported and a rapidly growing stamp famine was developing in America. A new chapter began for Kenmore in 1947. After serving in the Eighth Air Force in England during World War II, Henry Ellis Harris, Jr. purchased the rights to the Kenmore name from his father and the following year reestablished Kenmore Stamp Company in the Boston suburb of Arlington. He, too, loved stamps and had been an avid childhood collector. Active in his neighborhood stamp club, he sold and traded stamps with his classmates in school, and by the fifth grade was selling packets of stamps on consignment to a dozen variety, drug and novelty stores around town. Saturdays were spent delivering new packet supplies on his bicycle, restocking the merchants' stamp counters, figuring how much a store had sold during the week, deducting the store's commission, and collecting the money owed. There was never a doubt in that boy's mind about what he wanted to do when he grew up. In 1951, Kenmore found a more favorable business and living environment in the State of New Hampshire, renting space in Milford's Town Hall. By 1965, Kenmore had spread over all 4 floors of the building plus the top floor of the telephone exchange around the corner. A new home for Kenmore was designed and erected on West Street in 1967, where we reside today. An ongoing investment in computer technology allows us to expand our importing operations and better serve our thousands of customers more efficiently, yet enables us to stay in touch personally with individual collectors. For over 80 years Kenmore has helped millions of collectors find value and enjoyment from the World's Most Rewarding Hobby! We measure success by the satisfaction our collector-friends receive, desiring to exceed their expectations at all times, to become the most respected company in the philatelic industry. Welcome to Kenmore.